Is it Possible for Cooking to Be Meditative? 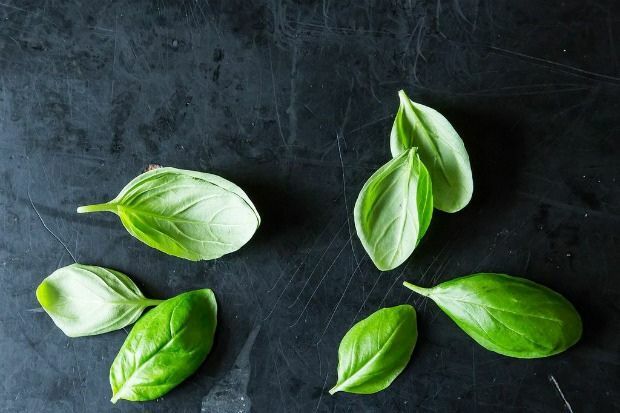 My path to enlightenment began in the vegetable aisle: Amid the fluorescent supermarket lights and zombied, after-work shoppers, I brought a bunch of wilted basil to my face and smelled it. It smelled mostly like basil, but also a little bit like plastic. But mostly basil. Mindfulness: achieved (so far). After writing about our editor's tips for a calm cooking experience, I—arguably the least Zen editor—decided to put them to the test (which is how I found myself stopping to smell the flowers herbs in Aisle 2). Their tips ranged from "cook barefoot" to "drink wine," and sounded like a romantic divergence from my average Wednesday night. But I decided this time would be different: I sent my boyfriend a short email of warning ("FYI, I'm supposed to have a totally Zen, relaxing time cooking tonight. K bye.") and left work early to gather my ingredients. My menu plan ressembled a bridal superstition: Because no one could agree on what I should cook, I had something old, something new, and some things borrowed from our C.S.A. At home I kicked off my shoes, poured myself a glass of Pinot Noir, and started with something I know by heart: My mom's baked tomatoes with basil and butter. While our editor Lindsday-Jean recommended that I kick everyone out of the kitchen, I let my boyfriend stay—with the understanding that he sit on the opposite side of the counter and limit his kitchen help to refilling my glass. I set to work peeling and coring tomatoes to the tune of an acoustic playlist (that Spotify promised would "give way to lingering notes of rich earthy folk"). After sliding the tomatoes into the oven, I sacrificed a cup of wine to reduce in a pan with brown butter and shallots. This is often the point in my stories where something goes horribly wrong—my beer can chicken goes for a swim, my ginger snap cookies melt into asphalt—but mercifully, nothing did. The tomatoes happily bubbled along, my sauce reduced then blended as planned, and I felt, oddly enough, at ease. 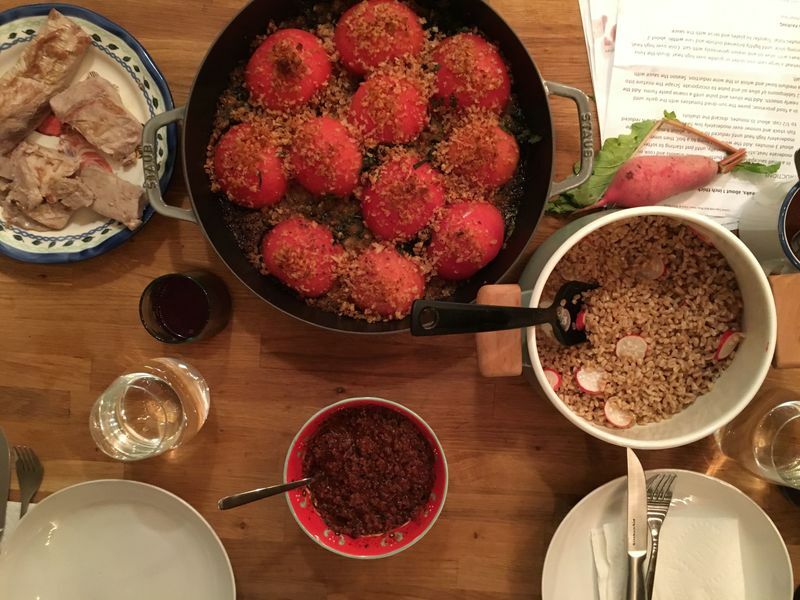 As my boyfriend set the table, I seared some tuna, then served it alongside their pinot noir sauce, an interpretive farro salad, and my tomatoes, and found that a relaxed time cooking flows naturally into a relaxed eating experience that lasted well past our bedtimes. It had me considering—if only for just a second—that maybe this whole slow down thing isn't so bad, after all. Have you had a memorable cooking experience lately? Tell us in the comments below! My always hungry husband silently enjoyed when I had a bad day at the bank. Many moons ago he intuited my homemade stress release as " therapeutic cooking ." We both benefited !!! So timely, and so true; Zen priest Dana Velden's new book, Finding Yourself In the Kitchen, which just came out from Rodale, is entirely on this beautiful subject. We are, I think, systemically in need of slowing down in the kitchen. Agreed- It'll be under many of my friends' Christmas trees this year! There's so much that is true and useful – just for getting along in life We who like food and its preparation know instinctively how much chopping and stirring and planning are, in themselves, lessons in gratitude. Someone just gave me a book I have barely cracked but it promises to be like this. Finding Yourself in the Kitchen by Dana Velden. She's a Zen priest from the Bay Area. Anyway, it seemed like serendipity to read this post and have this book in the same week. I'm glad you found your Zen, Leslie! That's one of the reasons weekly menu planning really doesn't work for me. I enjoy cooking when I'm in the mood to make whatever it is, so that often finds me stopping at my local WFM to pick up any findings my pantry might be missing. 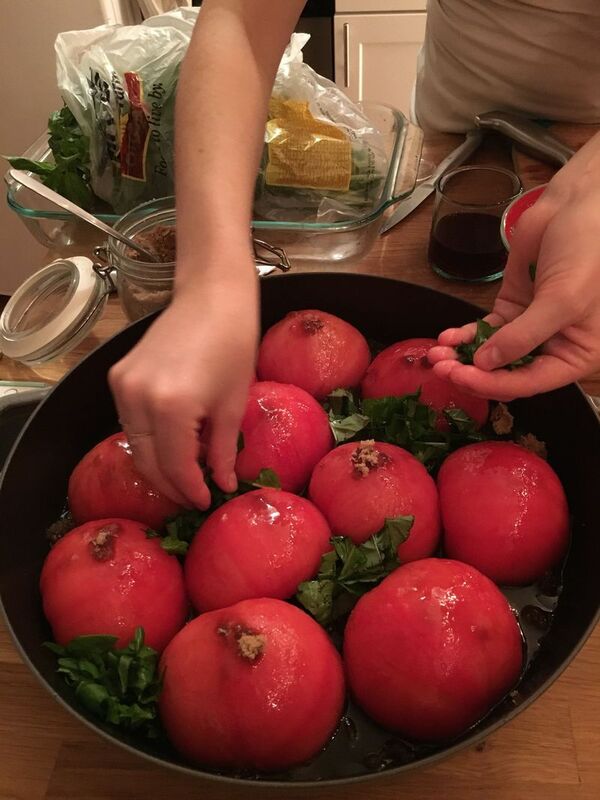 And BTW, will you please post the recipe for those Baked Tomatoes with Basil and Butter? They sound wonderful. It's linked in the post but here it is! (https://food52.com/recipes/38987-baked-tomatoes-with-basil-and-butter) It's truly one of my favorite dishes—my only suggestion is to use smaller tomatoes than those shown in the photo so you get a higher ratio of buttered bread crumbs to tomatoes. Enjoy! I find making jam to be meditative. The entire process from preparing the fruit to hearing the sound of a jar seal brings me inner peace and a sense of fulfillment! There is a chocolate cake recipe by Nigella Lawson that calls for coffee and flour to be added one spoonful at a time, alternating. Delicious cake, but if that isn't meditative I don't know what is. I nearly always find cooking meditative. I used to spend my commute thinking about what was in the refrigerator, what sounds good to eat, how I feel about it, so that by the time I hit the kitchen all the problems/decisions were made. In those days a glass of wine always went with the cooking time, so maybe that is a cheat, but it was my favourite time of the day while my son told me about his day at school.